Spend an afternoon in Kris’s home and studio with other OPA members! Sunday, March 31 from 2pm to 5pm. Please Register to RSVP! You must be an OPA member to attend the event. Take your booth to the next level and learn some techniques to sell with confidence at Ceramic Showcase and any other sales festivals! Kris Paul will share her knowledge of setting up and designing a booth, creating a display that will draw in your ideal customer, and build a relationship with collectors who will come back to you year after year. Kris will show the evolution of her booth design through her 10+ years of selling from her booth, and also draw from her experience from being manager and setting up displays at the Japanese Gardens Gift Shop. Her husband, architect Willy Paul will talk about design layout for creating a comfortable and inviting space. Bring photos of your booth, a sketch book, and questions! Kris will give you one-on-one feedback on techniques to bring your booth to where you want it to be. Kris has recently been promoted to Cultural Art and Ed. Dept. Assistant at the Portland Japanese Gardens, where she assists with cultural planning, art curating, workshops and training. 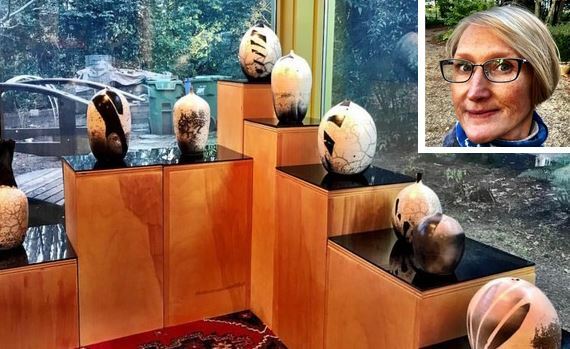 She is a former OPA Ceramic Showcase chair, and has exhibited in fairs and galleries across the West.